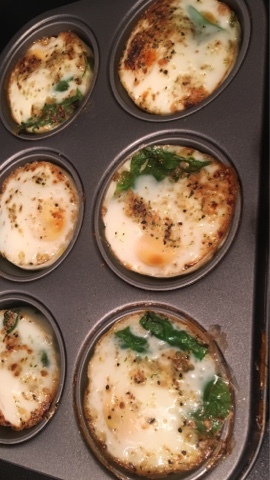 Blonde Ambition: Baked Spinach Egg Muffins! Quick little recipe that takes less than 5 minutes to prepare and 12 minutes to cook! 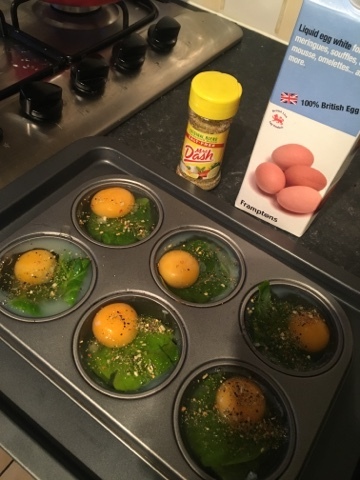 I generally start my day with a good serving of proteins and fats, to which this recipe covers perfectly! Tear up the spinach and use it to line a non stick muffin pan, I accounted for a cup of spinach but realistically used a lot less than that, you need maybe 3 leafs per muffin hole. Top the spinach with egg whites, you want to fill roughly half of the muffin hole. Top with you favorite seasoning & bake in the oven at 190 for 12 minutes until the egg is set. Let it cool, storage et voila! Breakfast is good to go!